When Dimond shared their latest they clued us into something we have been waiting patiently for – the 51 Speedshop cockpit. 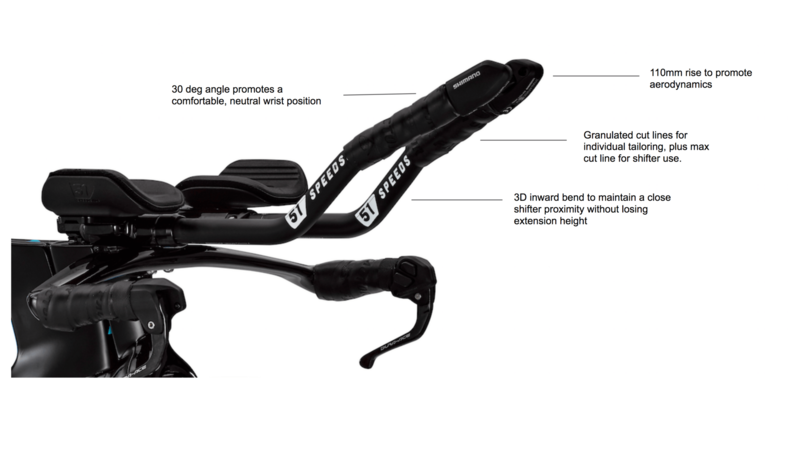 We’ve known it was coming for a while but the images from earlier this week was the first glance we had it … until we checked out https://51-speedshop.com/pages/mono-riser-aerobar-system. Unfortunately images are scares and 51 Speedshop isn’t ready to share all the details. But their site does detail a few things. A Kamm-Tail airfoil design helps hide this bar from the wind. While radial shaping of the pursuit bar, combined with a 5 degree up tilt gives the rider greater control over the bike. 51 Speedshop continues the growing trend of a “mono-riser” mounting system that allows height adjustment, angulation and stack adjustment through a simple 2 bolt design. There will be three extension shapes available. Arm pad width adjusts from 142mm – 255mm by utilizing one of the two included wing options. Arm pad stack up to 60mm and reach by 50mm. The bar is 400mm in width with a drop of 20mm. And a pad & extension angle adjust from 0 to 10 degrees. Unfortunately for now that is all we have. But as soon as we get some more details we promise you will be the first to know. Until then make sure to keep a sharp eye on AeroGeeks.com for your latest Kona coverage.